Locust in Dentist theme. White B/S opens the battery-line with the first move. Black masked-battery creation. - Sacrifice of black with the Locust move along the pin-line. 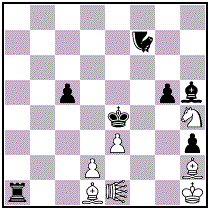 - The defense of black from Locust - a block of King's opposite square - uses a special nature of Locust piece.